through metal grates and onto conveyors. fill or empty a cargo wagon in about 5 seconds. concrete pad of the Bulk Rail Unloader serves a similar purpose. could not align with other rails. you are likely to load or unload a few more items than expected. any you find to the mod thread. stacks to prevent them from getting too out of balance. handle any item at all. of supported items for your own use. player intervention may be needed to complete construction. Arch666Angel for the loader graphics. Enable walking and driving vehicles through loaders. Enable using the pipette feature (Q) with loaders. Fix crash when clicking a single point to create a blueprint. Fix misleading loader placement guide. You must now actually research the technology to unlock rail loaders and unloaders. Fix crash when creating a blueprint with a GUI open in Factorio versions before 0.16.21. Fix crash after mining a loader under certain circumstances. Loaders do not lock in an item if set to accept all items. Fix bug building new non-locking loaders. Add partial support for preserving circuit connections in blueprints. Add alert to map when robots cannot build a loader due to missing rails or an obstruction. Fix failure to join multiplayer maps with unconfigured loaders present. Fix crash when placing loaders set to "any" item type. New feature for increasing throughput: interface chests. Loaders no longer lock onto a single item. Instead they handle up to 5 item types per cargo wagon. Since this leads to increased message frequency when loaders reconfigure themselves, you can now turn these notifications off. Add support for Omnimatter's omnite ore. Fix crash when migrating from a save with unconfigured loaders. Fix crash when building on top of modded rails. Fix crash when build conditions are not met (colliding entities, rail not present). Add support for Pyanodons Coal Processing. Fix configuration on train arrival. Prevent loaders from being built when there is only one rail underneath, which could block connecting rails from being built, particularly when building a blueprint. 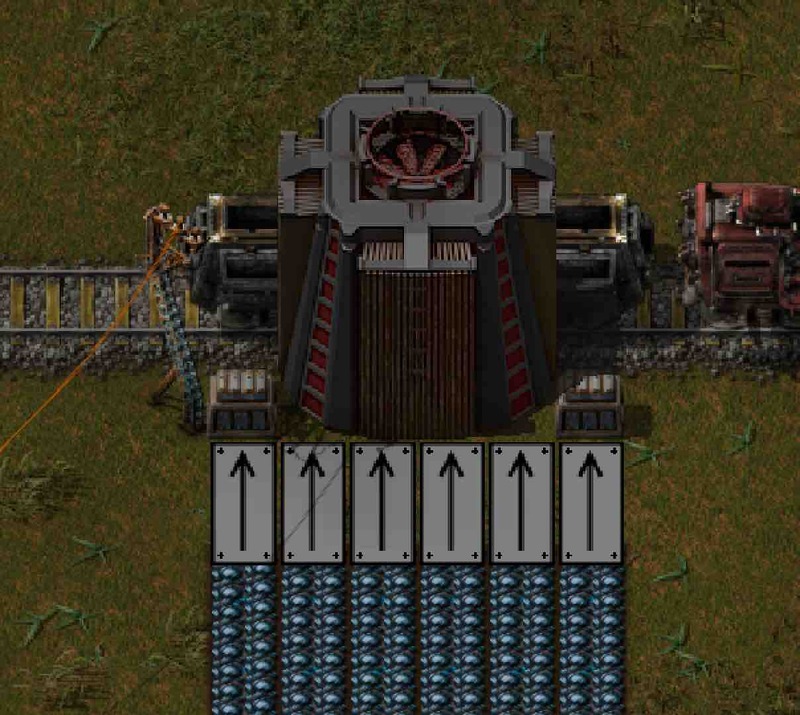 Prevent loaders from being built over curved rails, which leads to odd "train driving through a wall" appearance. Give better messages when a loader can't be built. Prevent rails blocked by loaders from being damaged, destroyed, or mined, since they cannot be replaced without removing the loader. Change how graphics are rendered. Fix crash on mining BRLs in Factorio 0.16.29. Improve handling of blueprint circuit connections. Marking a BRL for deconstruction also marks the underlying rails. Add support for interface chests of any size. Add support for plastic bars, Angel's geodes, and MadClown's Extended Minerals. Fix a rare migration bug from early BRL versions. Major change: BRLs are now placed independently, instead of on top of existing rails. A best-effort is made to update blueprints in characters inventories, chests, blueprint books, etc. You will have to re-create any blueprints exported to your library. Fix use of logistics chests as interface chests. Fix crash when marking BRLs for deconstruction. Fix rare crash related to on_nth_tick() processing. Update bulk materials list for PyIndustry mods. Add workaround for Creative Mode's Instant Deconstruction. Add circuit control via virtual signal. Fix crash experienced with PickerTweaks. Add compatibility recipe for xander-mod. Interface chest transfer is now stopped when the "Disable rail loader" signal is sent. Fix crash bug on building BRL. Fix crash bug on changing permitted items setting on an existing map. Use high-res rail and wagon sprites. Layer unloader platform below belts.